There is a good news for all smartphone lovers. LG Optimus G Pro is about to lend in your near by smartphone store. Yesterday i.e on 4th July 2013, LG announced this phone officially in India and after the release of phone it has become the trending topic of top microblogging website Twitter. Lets have a look over this sensational “Gadget of the month”. The LG Optimus G Pro comes with a 5-inch Full HD multi touchscreen display with the all new Android 4.2 Jelly Bean OS. 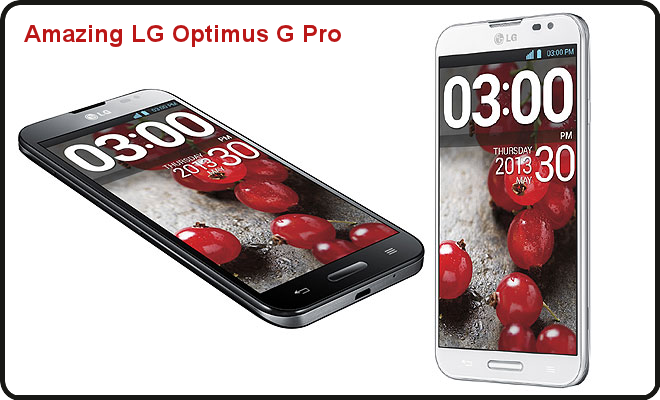 Optimus G Pro has 1.7GHz Snapdragon 600 quad core processor. 2 GB RAM and 32 GB inbuilt memory. If we talk about the clarity of the camera, this phone has 13MP camera with LED flash which is more than enough to make your moments very special. The smartphone also features a screen that packs over 2 million pixels, which is twice as many as on other smartphones with HD screens. This LG Optimus G Pro features an additional application “Dual Camera recording” which allow users to make videos and click photographs from both the cameras simultaneously. Another most attractive and stand alone feature of this smartphone is “Extreme Long Battery Backup“. On a single charge of the battery 3000mAh, One can access this smartphone approximately 15.5 hours of talk time or around 24 days of standby. With all the above adroit features this gadget looks like a corival of Samsung Galaxy Note II. The LG Optimus G Pro is available in the two most classy and common shades (White and Black). Now with all these amazing features, smartphone lovers can get this smartphone in just 42,500 INR which is quite reasonable in front of the gadget functions. With the launch of this smartphone LG is just trying to shake the smartphone market.